Update: The Happy Cup is now Homespun Kitchen. They still offer frozen yogurt, but focus more on acai bowls, wraps, and the like. This review may or may not reflect the current restaurant. Walking through the Beaches Town Center at the end of Atlantic Boulevard, you’ll run into a little frozen yogurt shop called Happy Cup. Except Happy Cup is so much more than just a frozen yogurt shop. Everyone’s had frozen yogurt and to most of us they all seem about the same or at least very similar. Happy Cup is different. First off it’s not a chain. It’s not a franchise. It’s the only one. If you’re into buying local, why should your yogurt be any different? Secondly it’s made from scratch and there’s nothing artificial added. Rather than the chemical laden, dairy filled science project that is most frozen yogurt with typically 18 different chemicals, at Happy Cup you’ll find all natural made from scratch goodness. On top of that everything is organic. Thirdly, they offer tons of fresh and healthy food options that are actually made from scratch just like the yogurt. 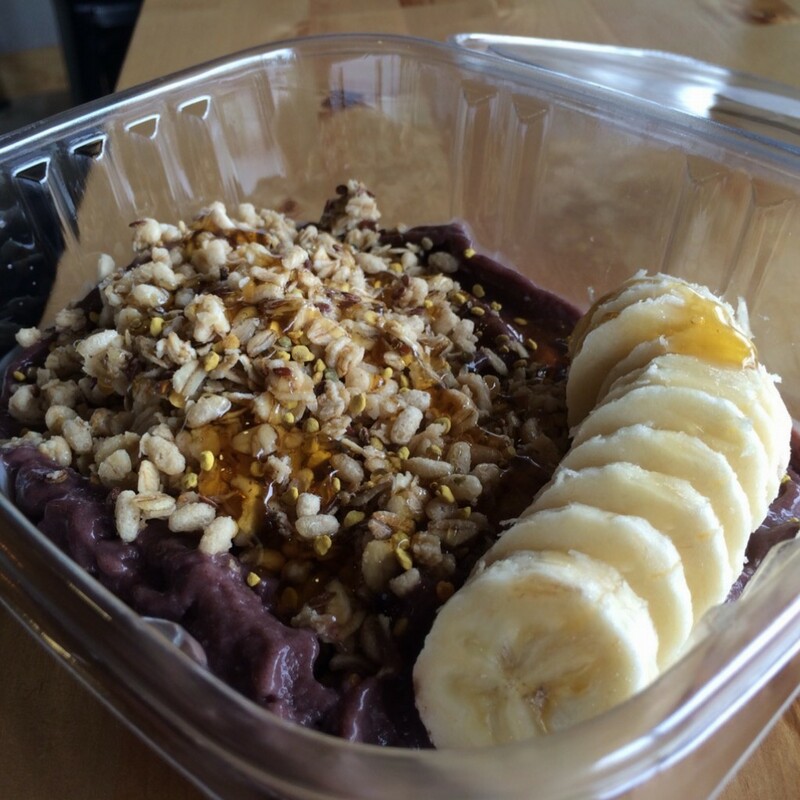 We started off trying the Acai bowl. Happy Cup makes this fresh in house. With fresh organic bananas and organic honey, this bowl comes out with just the right amount of sweetness and has no added sugar. If you tend to like really smooth textures and natural fruit flavors this one’s perfect for you. Next up was the Southwest half and half bowl. 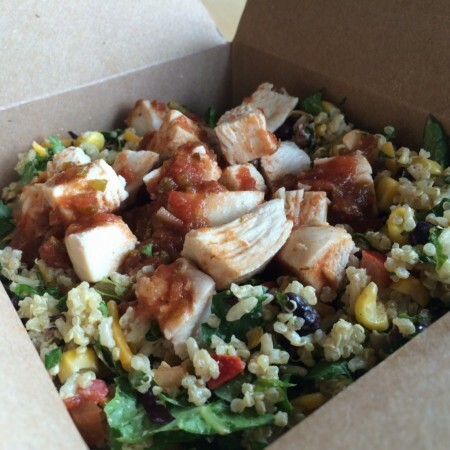 At Happy Cup when you order food you have the option of selecting a salad, a protein bowl (quinoa and brown rice), 50/50 bowl (half salad and half protein bowl, or a wrap. The southwest half and half bowl we tried contained black beans, corn, red pepper, cheddar cheese, salsa, and chipotle ranch. This bowl tasted fresh and slightly smokey. There was no doubt Southwest was the right name for the bowl as each of the flavors involved fit the description perfectly. Just a little spice from the salsa finished each bite with just the right amount of kick. I’d come back for this one. Next up was the Asian protein bowl. Almonds, carrots, green peas, ginger miso, and teriyaki sauce plus brown rice and quinoa made up this one. Too often teriyaki sauce has a thick and incredibly sticky quality too it almost like honey. The one Happy Cup uses is a good bit lighter. In each bite you tasted the flavors of the ginger miso dressing really came through. If ginger and miso are in your wheel house this bowl’s for you. After we tried a couple of bowls it was on to a wrap. The Southern BBQ wrap is made with a 100% whole grain, all natural non-gmo wrap. Ours contained cheddar cheese, red onion, corn, bbq sauce, and ranch plus turkey bacon. This one was so full of dressing I had a hard time eating it. If you like your salad loaded up with dressing then the amount of dressing in this wrap will be perfect for you. If like me you prefer a little less dressing then make sure to ask them to go light on the bbq sauce. I’m not normally a big fan of turkey bacon but the taste of the turkey bacon in the wrap matched the flavors in the bbq sauce perfectly making for a winner. We couldn’t come and not sample at least one breakfast item so that next thing we tried was the Sweet Heat breakfast wrap. 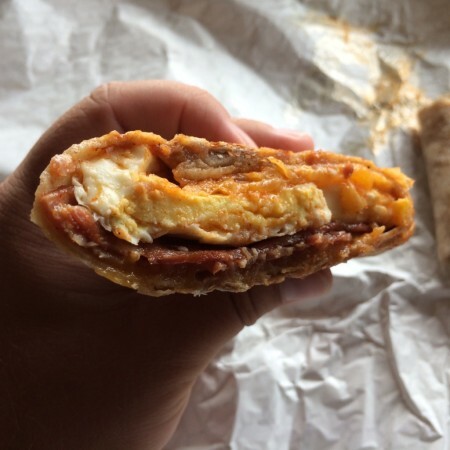 The Sweet Heat is made up of egg, cheddar, turkey bacon, hot maple sauce, and chipotle. This was my least favorite of the items I tried. It wasn’t bad, but it just wasn’t as awesome like the rest of the items I tried. Egg and cheddar come through the strongest in each bite. If you’re vegan or you’re in the mood for a smoothie that doesn’t contain dairy then the almond crunch smoothie might just be your thing. Containing almond milk, banana, almond butter, granola, and agave, the almond crunch smoothie offers up a taste that’s sweet, fruity and a bit nutty. We enjoyed it. Last but not least we gave The First Date shake a try. The First Date contains vanilla frozen yogurt, almond milk, almond butter, and Newman’s O’s (like organic Oreos). This milkshake is like the almond milk version of a cookies and cream milkshake with a bit of coconut thrown in for good measure. I’m not usually an almond milk fan but I loved this one. The fact that it’s healthier for me than the typical cookies and cream milkshake is just a bonus. As I sat in the store, folks from all sorts of different businesses in the area popped in. The team at Happy Cup seemed to know them all. Next time we’re at the beach we’ll surely be stopping back in at Happy Cup. 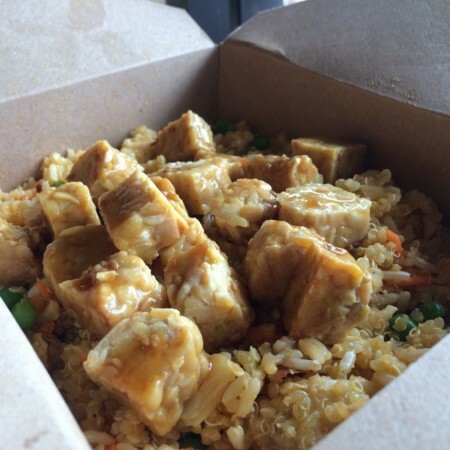 If you’re looking for some place that will serve you fresh, healthy, all natural food that actually tastes good then you need to head over to Happy Cup. Maybe you’ll run into us while you’re there. Tagged breakfast, Frozen Yogurt, Healthy, kid friendly, vegan friendly, vegetarian, Wraps. Bookmark the permalink.